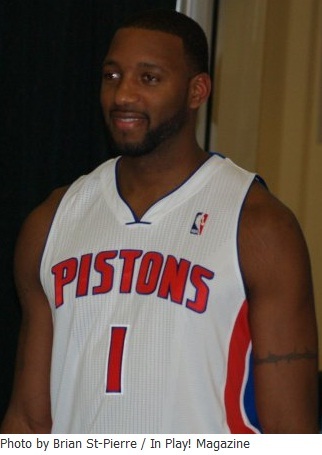 Tracy McGrady signed a one-year contract with the Pistons this past summer after no other NBA team would offer him a guaranteed deal. After a slow start, T-Mac is beginning to round into form, working up the rotation all the way to the starting five. A former NBA superstar, McGrady has suffered the past few seasons from various knee, back and shoulder injuries. As a result, nobody wanted to take a chance at signing him for fear that he’d get hurt once again. The Pistons, desperate for some type of splash during the offseason, were the only ones to step up to the plate. The Pistons continue to struggle, as they did a season ago. Though they were ravaged by injuries last year, they’ve remained relatively healthy this season. Therefore, injuries cannot be used as an excuse. Because the team has struggled, John Kuester, Pistons Coach, has had to change his rotation on numerous occasions. One of the few positives this season has been the play of McGrady. He’s stepped up as a vocal leader, something the Pistons have not had since trading away Chauncey Billups in 2008. McGrady has also been Detroit’s best ball-handler, so much so that he’s been inserted as the starting point guard. Kuester’s probably more grateful than anybody to have the veteran swingman on his roster. He’s had difficulty finding a combination of players to stick with as a rotation. In terms of the backcourt, Kuester had been using Rodney Stuckey as the starting point guard but hadn’t settled on a shooting guard between Rip Hamilton and Ben Gordon. It appears that Stuckey will now shift guard positions with T-Mac, allowing Gordon to continue coming off the bench. Hamilton, reportedly close to being traded by the Pistons, has been taken out of the rotation entirely. It isn’t just the backcourt that Kuester’s been waiting on. While Tayshaun Prince has held his own at small forward, the Pistons’ post players have struggled to stay consistent. Ben Wallace has been the starting center all season, but he’s clearly past his prime and unable to handle playing in the middle. At power forward, Kuester’s rotated several players in and out of the starting lineup, including Daye, Charlie Villanueva, Jason Maxiell, Greg Monroe and Chris Wilcox. It’s proven difficult for the players on Detroit’s roster to stay patient and wait for their minutes to come. Players have openly complained about their inconsistent minutes and seem hopeful that a trade involving Hamilton could open up more playing time at least in the backcourt. Clearly, the Pistons are much more relaxed when they don’t have to worry about looking over their shoulders when they’re out on the floor. With a healthy McGrady, the ball’s been moving more on offense. As long as he can handle staying on the floor, T-Mac will likely remain a starter the rest of the season. It remains to be seen who will emerge as the full-time starter at shooting guard. Stuckey’s a restricted free agent at the end of the season, so with Hamilton’s days in Detroit likely coming to an end Gordon appears to have the best chance of winding up back in the starting lineup between now and the end of the season. Up front, Prince will remain at small forward. Because he’s also a free agent at the end of the year, there’s a very good chance he, too, could wind up being traded. The long-rumored deal that would send him to the L.A. Clippers for veteran center and Michigan-native Chris Kaman could finally come to fruition. In the meantime, expect Wallace’s minutes to decrease as Detroit gives extended minutes to Monroe at center. Unfortunately, power forward will likely continue to be a juggling act all season. Injured veteran Jonas Jerebko hopes to return sometime in February, so it’s possible he could wind up starting either at power forward – as he did a season ago – or at small forward if Prince is dealt. “It’s a long season still…” Kuester says. “…The bottom line is we’ve got to regroup and understand that we hope that (players) learn valuable lessons in these things. If you want to be successful, period, you’ve got to approach your work with a tremendous amount of heart.